If enough people agree on something it starts to exist. This is rather worrying. Suppose everyone starts believing in something that's wrong? An agreed consensus of reality can result in everyone being dead wrong about certain facts. Look at those societies where they believed that the Earth was flat and at the centre of the universe. The fools. But at the time it made perfect sense and if everyone agreed that it was the case then it was so. Not so much a lie as a case of mistaken identity, but even so - the beliefs of the many outweigh the beliefs of the few. Effectively the Earth was flat in those days to all intents and purposes. However, even though we know better now, on some levels we still think of the Earth as flat. This is because maps are flat and if they want us to continue believing that the Earth is made in their image, they actually do have to start lying to us, or if not lying then at least distorting the truth. 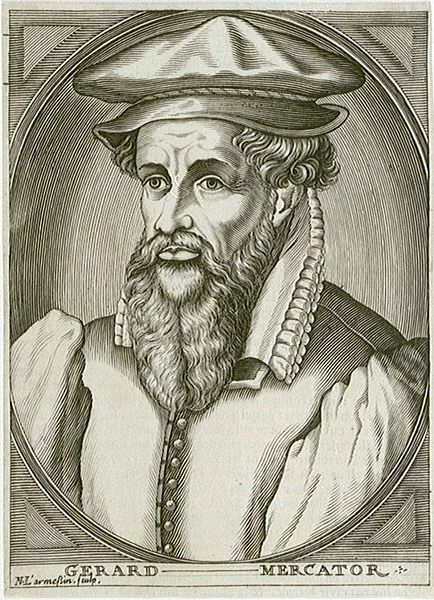 In fact Gerardus Mercator was a sixteenth century cartographer from Flanders, and it's his fault that maps started to lie. The central conceit of this way of mapping the world is that the meridians are parallel, which made navigation using these maps far easier than ever before. Whilst the meridians are theoretically parallel, in truth they're curves that meet at the poles. 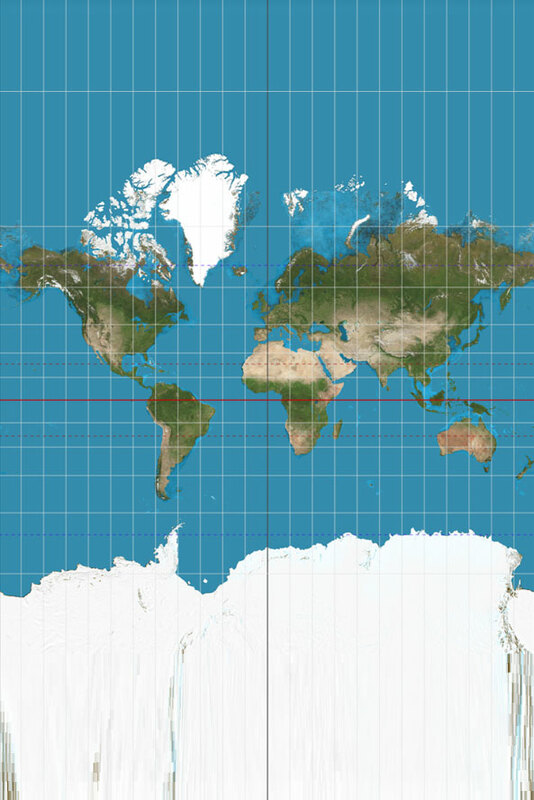 The closer one gets to the poles, the more the Mercator Projection distorts reality. In reality Greenland is 14 times smaller than Africa and not nearly so wide at its northern edge. And the further north, the greater the distortion. When I discovered this I felt betrayed by Gerardus Mercator. Stupid Flanders. These exciting arctic continents didn't exist... It also used to bug me that these world maps didn't go all the way. 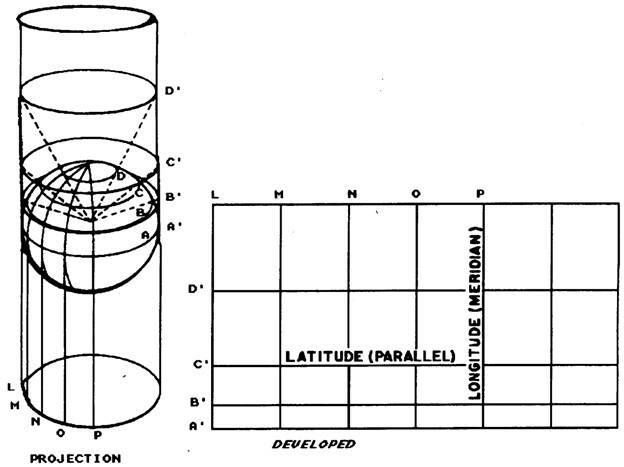 I knew that the poles were at 90° latitudes - why did the maps all stop at 75°? The answer, as all interesting answers do, involves infinity. It's all to do with how Mercator performed his projection. Imagine a globe of the world (the only truthful map) wrapped in a cylinder of paper. At the centre is a light bulb - this projects the shapes of the continents onto the paper giving us parallel meridians and increasing distortion the further poleward we go. As we can see the light from the bulb passing through the poles would shine straight upwards and never reach the paper. A Mercator projection map is infinite, and a large enough one would show a hubcap near the north pole as a vast elongated ellipse far bigger than Australia. Some have put forward theories that Mercator Projection is a tool of the Capitalist West given that on it Europe and North America appear far larger and more significant than Africa and other third world areas they exploited. Whilst it's true that these maps might have subliminally shaped the childhood attitudes of imperialists along these lines in the classroom, I don't think Gerardus himself had such a sinister agenda. He was just trying to make it easier to sail a ship in a straight line without getting lost. Others have tried to come up with fairer projections than Mercator's, but whilst some manage to maintain the correct areas of landmasses in comparison to each other, the continental shapes themselves end up warped as if the polar regions are being viewed out of the corner of your eye through the distorting lenses of a pair of bottle-bottom spectacles. More cartographic lies in other words. An America professor called Johnny P Goode (no really) tried to come up with an alternative in the 1920s, the snappily titled Goode's Homolosine Equal Area Projection, but in that the Earth ends up peeled like an orange and you get the uncanny feeling that there are vast wedge shaped voids in the middle of the oceans into which an unwary ship might fall. 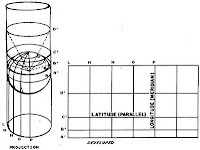 Despite our pretensions to three dimensionality, when it comes to finding our way about we no more make use of the third than the inhabitants of Flatland by schoolmaster Edwin Abbott Abbott (such a good teacher they named him twice). Gravity pulls our minds down into two dimensions like ants crawling about on the surface of a balloon. If we properly make it out into space properly, how are we going to chart the heavens in a way we can understand it? No doubt the star maps of the 22nd Century will have to find new and interesting ways to lie to us. But so far the lies maps have been telling us have been lies to help us understand, the kind of lies a parent might tell a child. Santa. The Tooth Fairy. Harry Beck's famous London Underground map is a prime example of this - it's far easier to get from High Barnet to Baker Street by reference to a brightly coloured wiring diagram than it would be if you had to use a geographically accurate representation of the tube. However, some maps are far more dishonest and perpetrate far more heinous deceptions. Cartographical entrapment. I am talking about Trap Streets (and I hope that anyone who may have come across my Tumblr mini-blog can forgive me this repetition). A Trap Street is a child of the copyright age, born of intellectual property paranoia. Despite the fact that you can't copyright reality, mapmakers are protective of all the work they might have put into charting the metropolises and even though they won't admit it, add deliberate inaccuracies to catch out any potential counterfeiters. Extra roads known as Trap Streets. There's no official list of these as that would negate their usefulness, but a little bit has been written about the location of some of them. With reference to this page on the Open Streetmap Wiki I had a look at the interestingly named Oxygen Street in Edinburgh. The existence of Google Maps Aerial View reveals this cul-de-sac for the lie it is. Until they start photoshopping the satellite photos, Google Maps Aerial and Street Views will be a polygraph machine for those dishonest diagrams. 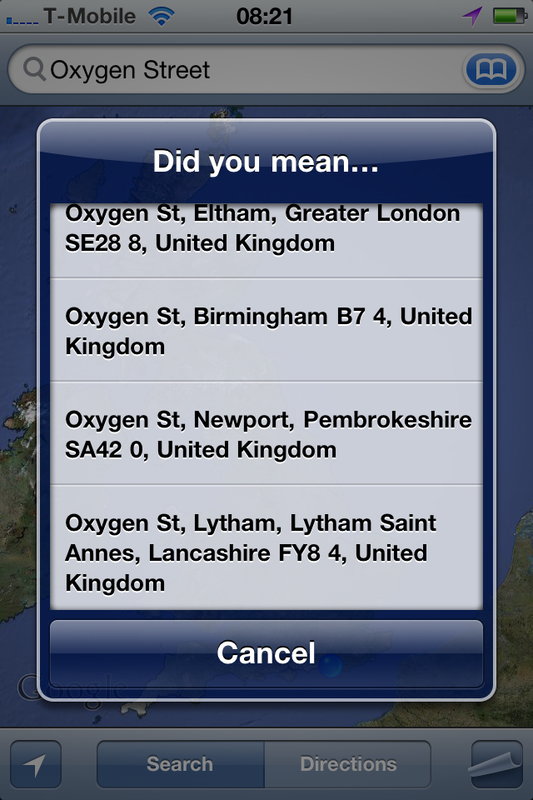 A short while later I wanted to find Oxygen Street again so searched for it directly. 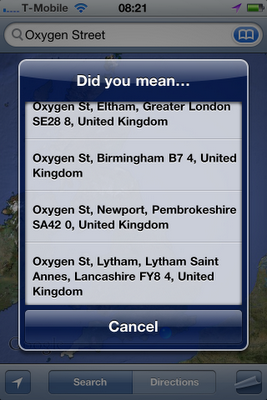 I was surprised to find a whole fleet of Oxygen Streets around the country. Closer investigation revealed them all to be cul-de-sacs, all the same length and - oddest of all - all non-existent. Oxygen Street appears to be the John Doe of cartography. There are no real Oxygen Streets in the UK. But there did used to be just one in the 19th and 20th centuries before it was wiped out by modern development. It was in the same location and was the same length as the current fictitious version in Birmingham. Wiped from reality, the thoroughfare refused to die and instead sprung up in the unreality of lies all over the country. Not so much a trap street as a ghost street.